You are currently browsing the category archive for the ‘insects’ category. “Maybe,” he said, with the skepticism of two science degrees and a certificate in education. I know, of course, that it did no such thing. I assume that when I cut it down to get rid of the scale, I cut down to whatever it was grafted to, and what I have is not actually a Meyer lemon anymore. I don’t know what exactly I do have, but it’s still citrus-looking, and it’s healthy, so I’ll see what turns up. This tree has caused me more problems, though. It’s the one that introduced scale into my house, and that scale has jumped over to my papyrus. I’d just reconcile myself to losing a plant except that that’s our wedding papyrus, and I’ve kept it alive for two years and I wanted to keep it a lot longer, but the main thing I know about scale is that it was impossible to clean up from the lemon (whatever) tree. I’ve been trimming the papyrus as I’ve found scale on it, but now it’s down to a single stalk, and it has scale too, and I don’t know that the plant will come back if I cut off this last bit. I’ve scraped off all the mature scale I could spot; I wiped off the tiny, tiny immature ones I also found marching down the stem; I’m going to watch it vigilantly and hope that maybe, against the odds, I can completely eradicate this damned pest. The beans are up, all four quadrants. This relieves me immensely. The culinary herb starts are definitely gone except for one (savory, I think). Well, maybe they’ll come back. I’ve watered everything again, in preparation for leaving tomorrow. I got my first mosquito bite of the season. Sigh. That’s another thing, like the weeding, that I forget about in the winter. Gardening in long pants and long sleeves is less fun than gardening in shorts and a tank top. But it’s better than no gardening at all. And that’s all it’s ever going to have. I noticed several days ago that it was droopy when everything else wasn’t, so I watered it. Yesterday I realized it was still droopy, even though it had rained. I poked around, and lo, there was a squashy brown section of stem with a white squash borer undulating its way through. I’ve always thought those hollow stems were asking for trouble. I killed the larva, but my plant is unsavable. There’s another potimarron plant, but it’s looking the same way, and I found a smaller brown patch on it, though I couldn’t locate the larva(e) before the mosquitoes drove me indoors. 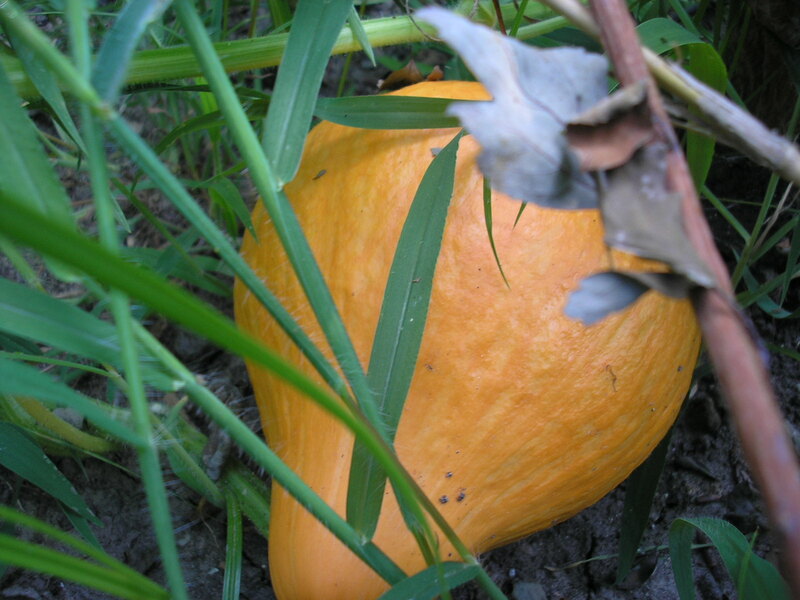 I need to check the plants again for larvae and kill them, and then check my other winter squash on the other side of the garden–Stella Blue Hokkaido and Waltham Butternut. Butternut is supposed to be somewhat resistant, and I’m hoping at least one of those plants will still be okay. Then I’m going to check my tomatoes in the hope of something red to cheer me up. I have approximately twenty-four mosquito bites on my legs. No exaggeration. I went into the garden to get the zucchini I knew was there and discovered that I actually have cucumbers. Four, and several more almost ready. So of course I picked them, plus some carrots for dinner, and I thought I felt foliage pricking the backs of my legs, but no: it was mosquitos. Twenty-four. I give in. No more shorts in the garden. On the other hand: I have cucumbers! And Zahra zucchini! And herbs and carrots and green beans in the fridge! I ate mostly from the garden tonight: grilled zucchini with oregano, lemon (store) potatoes with parsley and basil, carrots and cucumber slices. It turns out Dragon carrots are beautiful beyond belief, but Red-Cored Chantenay taste better. In the next few days we’ll be making pickles, and I’ll be checking the tomatillos because I think they’re starting to form fruits but I’m not sure, and I’ll be harvesting more zucchini and trimming its leaves and tying up the tomatoes. In long pants. We broke down and called Orkin about the carpenter ants in the kitchen. They had actually slowed down while we were gone, but now that we’re back, so are they, and I couldn’t take it anymore. Eric scheduled their visit yesterday at five. When I came home, the Orkin man was just going over paperwork and driving away. “The ants should be dead,” Eric reported, “and if not, they’ll come back again for free. It’s part of their guarantee.” I rejoiced. I wasn’t excited about mass murder of ants, but I wasn’t excited about never putting anything out on the counter again either, so I was ready to embrace better living through chemicals. However, I went out to the garden today. (I’ve been working in the yard today and yesterday, making up steps for the walking challenge and also moving the daylilies because Eric can’t stand them anymore. I’m moving them to the bindweed-infested area by the driveway because in a daylily-versus-bindweed showdown, I might just put my money on daylilies. And if not, I still won’t have to weed as much.) I’m pleased to report that the corn is forming little cobs, about two per stalk, and I’m already planning a Corn Party. Also that one zucchini is swelling and that the beans are going strong. I am not pleased to report that the Orkin man sprinkled boric acid all through both of my gardens. Not just the part near the house, but all through them. I admit that the vegetable garden borders the garage, and the garage has a leak in the roof, and therefore it’s not a bad place for ants to be nesting. Even though we haven’t seen the carpenter ants outside. Apparently the Orkin man also put boric acid on the tree on the very edge of our property, where if there are ants they’re more likely to bother the neighbors than us. I also admit that boric acid is not a huge deal, not dangerous to humans or massively bad for insects. I further admit that it’s not like the garden insects seem to have suffered, considering all the flies and leafhoppers and grasshoppers I saw as i was taking stock. But I am displeased anyway. I decided not to bring harmful chemicals into my gardens (or not ones that the plants hadn’t made themselves, I suppose). I decided to live with the bugs. I decided that I wouldn’t live with the bugs inside, but I thought that was a separate decision. Apparently it wasn’t. There’s one thing I’m finding abhorrent about gardening. This thing is: that I can’t garden without long pants and long sleeves or I’ll be eaten alive by mosquitos. I currently sport…let me count the throbbing spots…six from a quick sojourn today, planting fall peas and some more broccoli and beets, when I thoughtlessly went out in shorts and a tank top as befitted the weather. I pulled a few beets to give more room to the others–I was shocked at how much they and the turnips grew while we were away. I have never eaten a beet before but I bit into a baby Chioggia today and I think I’m going to grow these things a lot. Not so sure about the turnips. I also pulled out some lettuce plants. Some of them have transformed into these gorgeous pyramids, starting flowers and proudly wearing their leaves, but some of them haven’t, and I want seed from the ones that haven’t, so out they came. Poor beautiful failures. I also harvested beans. There are Cherokee wax beans–the ones I planted around the Christmas tree, and I’m thinking that would have been a better idea with pole beans; these are bush and I don’t think I like that–and Trionfo Violettos. I planted some actual green green beans, Kentucky Wonders, today alongside the peas. 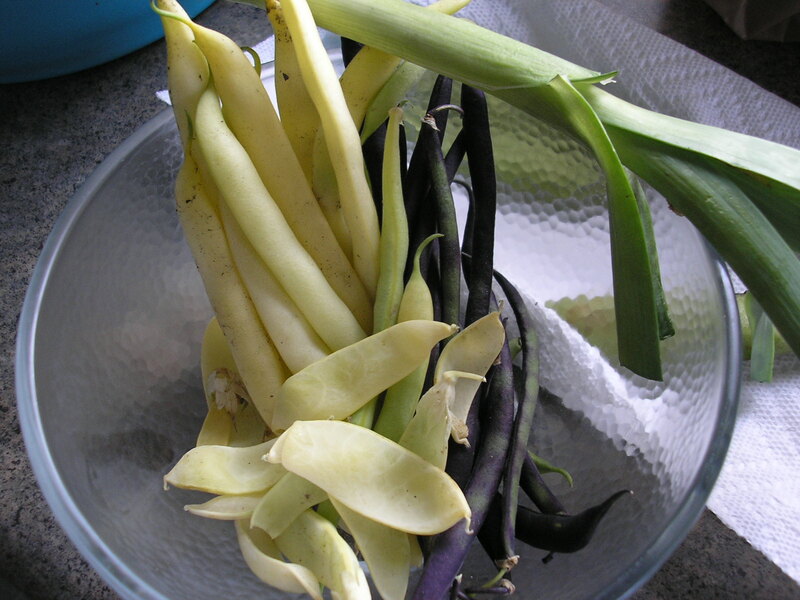 I actually harvested my first beans Thursday, just before we rushed off to a Jonathan Coulton concert (which was excellent), along with a baby leek and a few stray last Golden Sweet pods, and these are them. I harvested just as many today. I’m thinking roasted root vegetables and green beans sounds like a good dinner option. 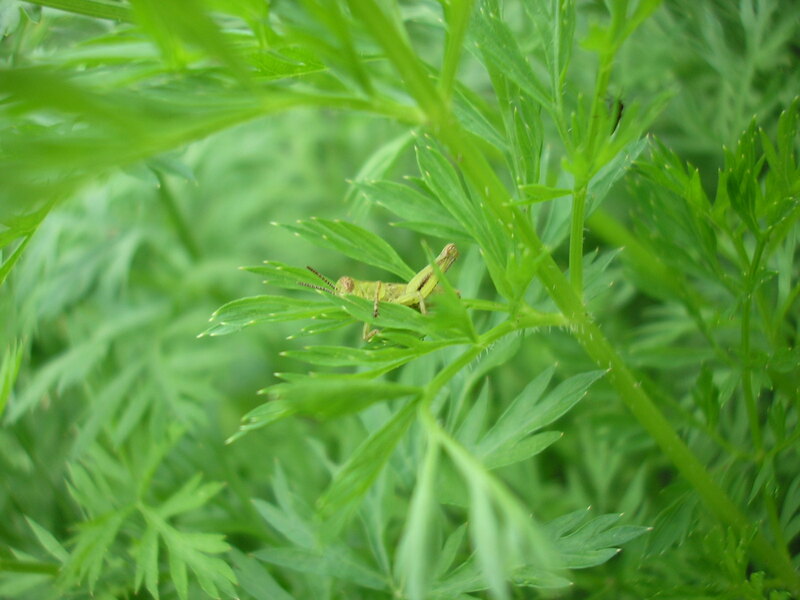 I found this little guy on my patch of Chantenay Red Core carrots a couple of days ago. The carrot patches are jungles of insects–beetles, flies, the occasional ladybug, and this grasshopper. I looked up grasshoppers and I should have killed him, but I probably wouldn’t have anyway. I’m not very afraid of locusts eating my crops (though I did read the Laura Ingalls Wilder books) and I’m kind of glad to see all these insects hanging around, as long as they don’t overstay their welcome. I feel like a proud hostess.